Umbrella strollers are your best bet if you like something lightweight to lug around for your baby. This is because umbrella strollers fold compactly and can be easily taken anywhere; you can throw it in the trunk of your car, take it to the subway or the bus, and check in at the boarding gate before riding a plane. They are the ones recommended when your family is out and on the go because they are very fit for travelling and are equally durable for long walks. The fact that they can be folded neatly also makes them easier to lug or carry around without putting too much strain on your arms. Bring an umbrella stroller with you is also easier than having to carry your baby all the time. With that in mind, you want to get the best stroller out there in terms of size, price, weight, and durability. In this article, we will enumerate and review the best umbrella strollers out there. What are the best-rated umbrella strollers? Below you will find different umbrella strollers with accompanying description and/or review. Hopefully, this will help you narrow down your search for the best umbrella stroller. This stroller is very compact, can be easily set up, and has a three-dimensional umbrella fold. The seat comes a three-point harness to help keep your baby secure whatever the road surface is. The hind wheels come with double foot break and the baby seat has a footrest for comfort. PROS: It weighs only about 7.1 pounds and can hold a baby or a child up to 40 pounds. The umbrella stroller, despite of being light, is constructed with good frame materials. The fabric is also well reinforced so you won’t see any fraying even after continuous use. The canopy is also big enough to shelter your child from the sun. CONS: Most complaints are on the handle bar, which is too short for the average height of American males. Average females, on the other hand, won’t have trouble with the handlebars. However, those who exceed the height of about 5’8” might strain their backs pushing this umbrella stroller. Compared to the Cosco umbrella stroller above, this one is stronger, sturdier, and more heavy-duty. However, it is also more expensive, about three times the price of the Cosco. 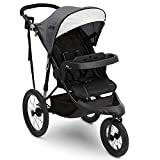 It has a durable frame that can take a child up to 50 pounds, a five-point harness for additional safety, a parent console, and a lower storage basket. PROS: The handlebar of this umbrella stroller is pretty high, so tall people won’t have trouble navigating the stroller around. They won’t have to bend, avoiding strained backs after a day of walking around. The wheels also roll smoothly, enough not to wake a sleeping child. The recline is also far back enough for them to comfortably nap. CONS: The safety strap for the child is a bit narrow and in some cases, may not even fit the child comfortably. The storage space underneath is also very small so you won’t fit a lot and is a bit difficult to access. Consider only putting small stuff in there such as snack or toys. 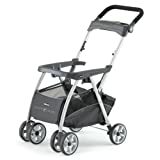 This stroller is made of sturdy materials but is still lightweight and travel-friendly weighing less than 12 pounds and allowing to be folded compactly. The seat can be positioned in more ways the one – it can be upright or reclined and offers a five-point safety restraint for children under 50 pounds. PROS: The three-tier canopy is great because it provides maximum protection from sunlight and UV. There is a parent tray located near the handles that is equipped with two cupholders. Underneath the umbrella stroller is a mesh storage bag that is wide enough to fit baby essentials such as milk bottles, diapers, change of clothes, etc. CONS: Although it’s not a big deal to some, the seats don’t come with extra padding so some children may find it uncomfortable. The seat can’t also be detached from the frame so you won’t be able to wash it with comfort. 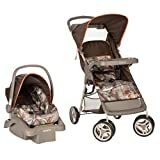 JOGGING STROLLER + TRAVEL SYSTEM: Use as a standard jogging stroller or create a travel system with your infant car seat (car sear sold separately) | SIZE/WEIGHT: 24.4"L x 44.9"W x 41.1"H | 26 lbs. This umbrella stroller may be your perfect buddy for travelling as it is quite compact when folded, can be carried easily under one arm, and only weighs 11 pounds. The reclining seat can be multi-positioned, offers five-point safety restraint system, and can accommodate a child up to 50 pounds. PROS: It comes with a snack and drinks tray for both the parent and the child and has three-tiers extended canopy to protect your child from the sunlight and UV and has a peek-a-boo window. It also comes with a relatively substantial container basket underneath that can fit most needs of your child. CONS: The cupholders are a bit too small to fit standard sippy cups and the fabric used for the stroller is a bit slippery and prone to fraying. When the product gets damaged, the manufacturer also doesn’t provide warranty, as experienced by some owners. This lightweight aluminum stroller weighs only 11 pounds and can be folded compactly. It has a two-position reclining seat and five point safety harness for the comfort and security of your child. PROS: The front wheel has suspensions that make rough terrains smooth, which are good as not to wake a sleeping child. It also pushes smoothly and has a handle bar high enough so that tall people don’t have to hunch forward. The sunshade is also great as you can unsnap it and change the angle depending on where the sun is. CONS: Some parents found that the strap is too short, especially the crotch strap. It is also not adjustable, which can be a problem if your child is too big. 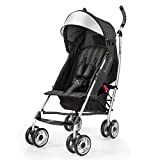 If you’re looking for an umbrella stroller that you can easily take anywhere, make sure to first check the weight and the sturdiness of the stroller. It should be able to live up through all your travels and be comfortable enough to carry around.